These Battlefield 1 tips will help you be a productive member of your team. 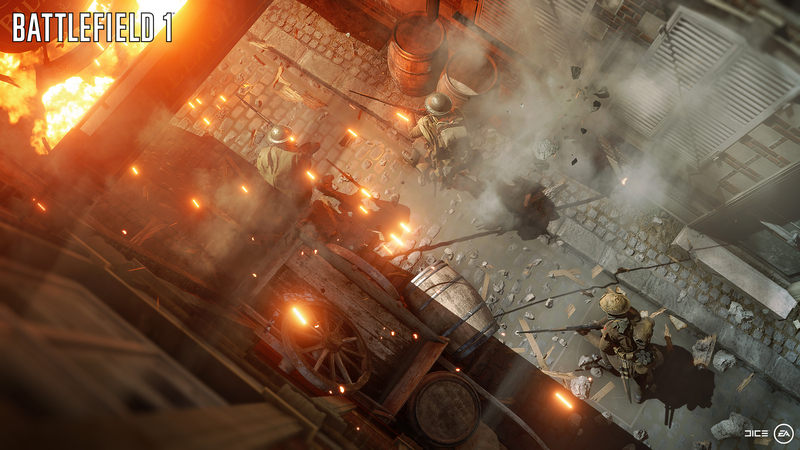 Before you jump head first into Battlefield 1’s multiplayer, it’s important to brush up on the old skills and even acquaint yourself with some of the new additions using our Battlefield 1 tips. Below, we’ve collated five Battlefield 1 multiplayer tips to help you get started on your Battlefield 1 career! 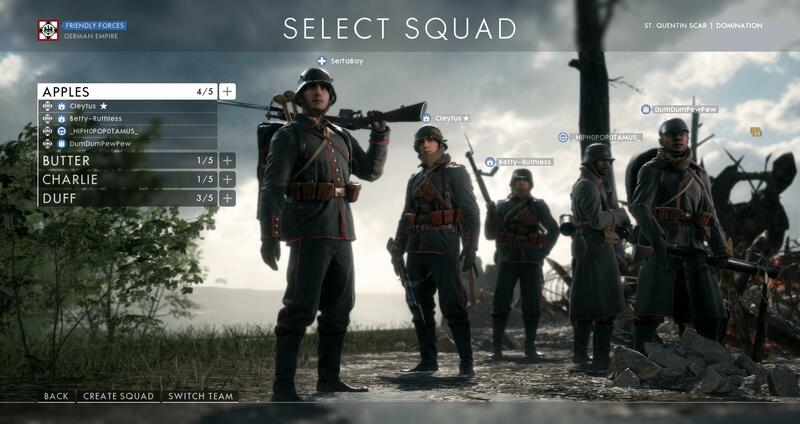 Multiplayer battles in Battlefield games often involve dozens of other players, so it comes as no surprise that the quickest way to ensure victory is to stick with other people. Thankfully, Battlefield makes this easy for players through the use of a Squad system. Before getting your boots onto the ground, take a moment to join a Squad. There are several benefits to being in a Squad, the first and most immediately obvious one being that you can spawn directly on another person in your Squad. Usually, you will only be able to spawn on a capture point or another location of interest, often meaning a long trek to get back into battle. The benefit of this also helps you as players in your Squad will spawn around you, even when you’re in the thick of battle. Another benefit of Squads is that you can easily see one another on the map and in the HUD. You’ll be able to work together without losing one another, or getting mixed up with who you were following. Plus, if you’re playing with friends there will be no confusion over which blip on the map is them! Choosing the right weapon for the situation is key to winning gun battles. Weapons are locked behind a level-up mechanic and in-game currency purchases. It’s not enough to merely reach the correct level, you will need to purchase weapons before you can use them in battle. However, the currency you use to unlock them, Warbonds, aren’t handed out on every corner like a newspaper from a paper boy. Take time to consider which weapons you think you ought to purchase. However, once you progress further into the game, you’ll find your stocks of Warbonds will grow, meaning a little more freedom in your purchases. Be mindful at the beginning of your Battlefield career, because there’s nothing worse than spending money on a gun only to realize you don’t like it, then lacking the funds to buy another. Battlefield 1 brings with it a couple of new classes while leaving behind the old faithful Engineer. However, the Engineer’s skills have been divvied up between the other remaining classes. There is now a Tanker and Pilot class, along with Assault, Support, Medic, Scout, and Elite Classes. The Elite Classes aren’t selected at the beginning of a match but can instead be found around the map as a form of powerup. The Assault class is all about the Anti-Tank weaponry with the use of grenades, mines, and rocket guns. The Support class brings all the ammo to the fight and the repair tool. 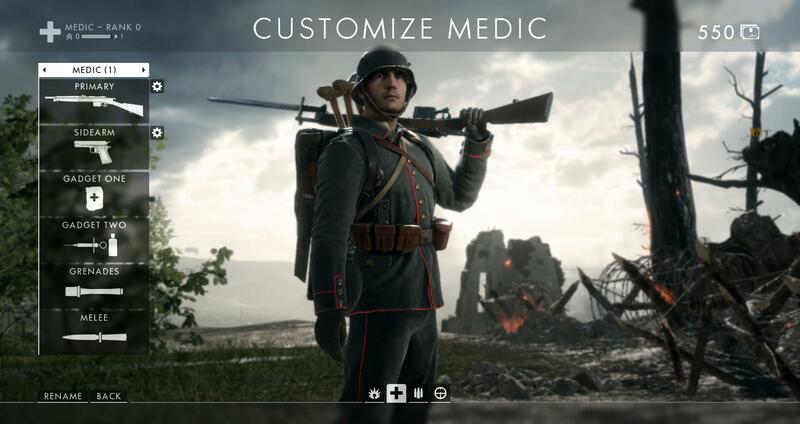 The Medic uses the syringe to revive teammates and medical supplies to heal allies. 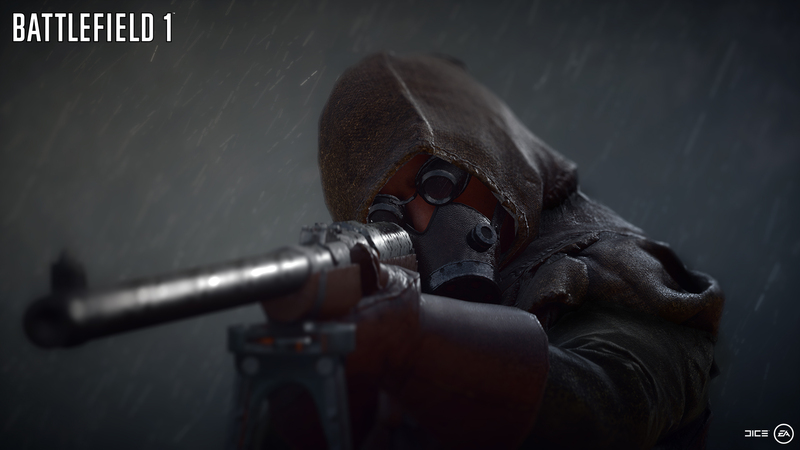 The Scout is the typical sniper class that uses telescopes, decoys, and even an armor-piercing bullet useful against Elite Classes. 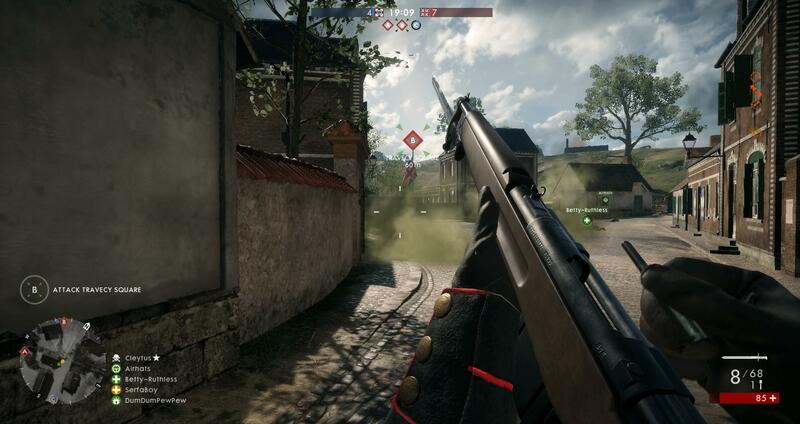 Whenever you choose to spawn on a vehicle, if you’re that vehicle’s driver, you will become one of the new vehicle classes, the Tanker, Pilot or Cavalry. Each of these classes specializes in using that given vehicle and comes with tools necessary to keep the unit running. However, outside of your given vehicle, you will find your firepower lacking in comparison to the other classes. Map knowledge is a huge part of being on the winning side. It takes time, but it will come. When you first start playing Battlefield 1 multiplayer, all the maps are going to be foreign to you, but to improve you’ll need to learn them. Take the time to soak up the environment, look at the major zones and figure out where everything is located. Once you have the larger strokes covered, focus in on the smaller details, like where the good sight-lines are, where you can throw grenades to push enemies out, and what buildings or walls are destructible. The more you know about a map, the more comfortable you will be in your skills and what you can achieve. By learning the maps in Battlefield 1, you will prevent the initial on-spawn confusion about where exactly you are in relation to everything else. You’ll be able to spawn and immediately recognize where you are and where you need to get to. When you learn the maps in Battlefield 1, it will also help you recognize strategies the enemy team might be implementing. For instance, if you know a large amount of enemies are at one position, you might choose to flank or sit up on a major sight-line in order to capitalize on their pushes. Arguably the most important skill to master in Battlefield multiplayer is the ability to play the objective. By “play the objective” we mean, figuring out what the purpose of the gametype is and focusing on ensuring that objective is met. A lot of the time it’s easy to switch to a single-minded focus of “kill the enemy”, but that might not cut it during a Rush gametype. It’s important to also be fluid in your appraisal of what the objective might be as you can often have smaller objectives within a major one. While the primary objective might be to push the enemy back in a game of Rush, a smaller objective could be to support a group of allies, secure a vehicle, or even just hold a strong position on a map. Whatever the case, it’s important to avoid tunnel vision and adapt to what’s happening around you. Battlefield 1’s multiplayer is a hectic and explosive experience, and for those just starting out it can be a bit overwhelming. The first thing you need to do to succeed is to follow these few Battlefield 1 multiplayer tips. By learning your Class, focusing on weapons, joining a Squad, learning the maps and playing the objective you will soon find that your skills improve and your understanding of Battlefield 1 will increase. What are some tips you think new players should know before heading into Battlefield 1’s multiplayer? Let us know in the comments!